In Part I of this series on creating effective sunglass displays we discussed high-end sunglass displays, all of which were some form of locking cases. Most high-end sunglass displays are locked up to prevent theft, and as we pointed out, locking up sunglasses in a case helps to create more perceived value for the sunglasses. In Part II of the series, we offered many examples of wood and metal material types, as well as examples of sunglass displays, accessories, and headers- all of which offer inspiration in designing sunglass fixtures. In this blogpost,w e will focus on mid-range sunglass displays. Generally, these are displays where the glasses are not locked up. There are a few solutions on the market where the glasses are locked, but there is no display case involved. These locking mechanisms tend to serve the anti-theft function, but generally they are not very aesthetically pleasing and hence not very popular. 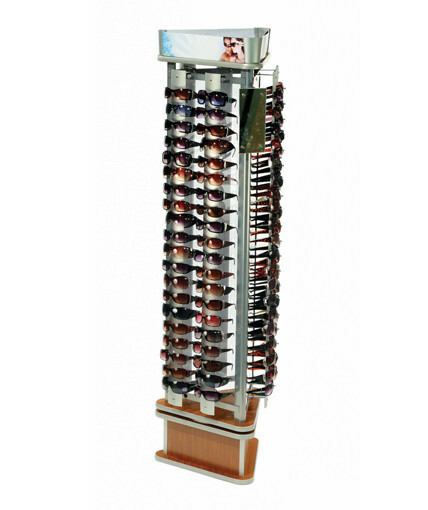 Mid-range sunglass displays still have the same goal as high-end displays, which is to increase the perceived value of the sunglasses and maximize sunglass sales. As a general rule, the nicer the display, the higher the perceived value of the sunglasses. Some design elements like adding LED lighting can have a big impact on both perceived product value and incremental sunglass sales. However, not many mid-range sunglass displays incorporate lighting largely because of the cost and also limited access to electricity in some retail locations. 1) Vertical Spacing Between Sunglasses- Most mid-range sunglass displays utilize some type of hanging system whereby the bridge of the sunglass sits on a peg, piece of bent wire, or a similar nose piece. 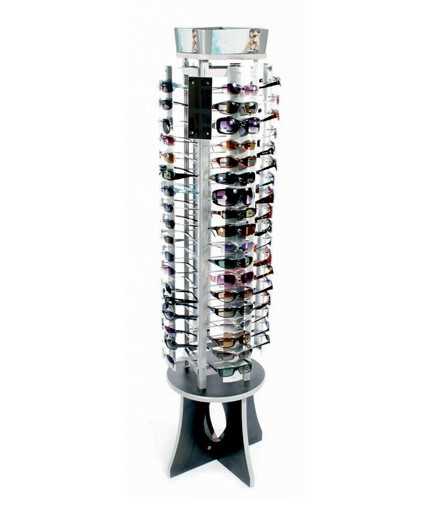 Unlike high-end sunglass displays, shelves are not as common in the mid-range. Not only is it important for the nose pieces to hold the sunglasses securely, but the vertical spacing between the glasses is important. Since sunglasses are a fashion item they tend to change in style from year to year. Large framed and oversized sunglasses might be “in” for a year or two, and then medium and smaller frames might start trending in the next year or two. We generally allow 2.75” between vertical nose pieces since that spacing is enough to accommodate the large frames while still looking good with the smaller frames. 2) Mirror- An effective mid-range sunglass display should incorporate one or more mirrors. Dale Carnegie once said that the sweetest sound in the English language is the sound of your own name. By the same token, human nature suggests that people want to look at themselves in the mirror whenever possible. This is particularly true when trying on sunglasses. We recommend using glass mirrors on mid-range sunglass displays. Although they are a bit more expensive than acrylic mirrors, they provide more of a premium image and eliminate the risk of the distorted “fun house” look that sometimes comes with acrylic mirrors. It’s also important the mirror is correctly positioned. If the mirror is at the top of the display, it will generally have to be angled in a downward direction so as to enable a 5’5” woman to see her face. If the mirror is on the front or side of the display, then it should also be positioned in a way that a 5’5” person can see into the mirror. 3) Grid System or Panel Management System- When displaying sunglasses, it is important to merchandise them in an open position rather than folded. Customers want to view the side of the sunglasses not just see the front lense view. The temples are often an important design feature of the sunglasses and often an area for add-on charms or other design elements. 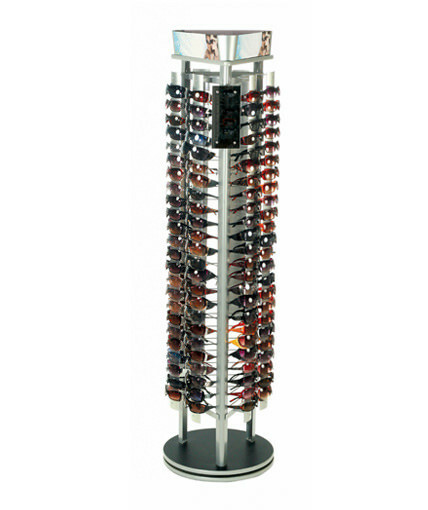 For our mid-range sunglass displays we generally use two approaches to displaying the glasses in an open position. The first way is to create a horizontal grid panel that sits several inches behind the nose pieces. The ear pieces of the sunglass display sit on the horizontal wires. The pros of this approach are that it creates an open, airy look to the display, and it tends to be easier for the shopper to quickly put the sunglasses on the sunglass fixture. The cons are that the glasses can possibly slide around if the fixture spins, particularly if the unit is spun too fast. The second approach is to utilize a panel management system. Instead of a wire grid, this approach uses a piece of PVC or acrylic with a system of holes that are created for the ear pieces. The advantage of this approach is it does a good job of organizing the glasses and prevents the glasses from sliding around. It also can act as a visual barrier so you can’t see through the display. The disadvantages are that it is a little more difficult for the shopper to put the glasses back in place quickly, and the panel can collect dust over time. 4) Nose Piece Panel or Backdrop Panel Color- Our experience suggests that sunglasses “pop” when there is a white, silver or light colored nose piece panel or back panel on the display. We recommend staying away from black or dark colors for those key parts. With dark panels the sunglasses tend to get lost since a lot of frames are black or dark in color. 5) Design for Servicing- We hear a lot from our sunglass industry contacts that servicing sunglass displays is an important issue. The display needs to be designed in a way that not only encourages consumers to keep it neat, but also it is important to make it easy for reps to service the fixture. Displays that have a lot of flat surfaces can collect dust quickly, and ensuring that hard-to-clean spots are kept to a minimum is always a good idea. 6) Header Sign- It is important to provide room for a header sign so that a sunglass unit can serve as a brand-building vehicle for the sunglass provider. Interchangeable signs provide the most flexibility and are generally recommended for most mid-range sunglass displays. 7) High Quality Bearing- Whatever sunglass display you buy, make sure it has a good bearing if it is a spinning unit. High quality bearings are necessary to ensure the display spins freely in both directions for an extended period of time. 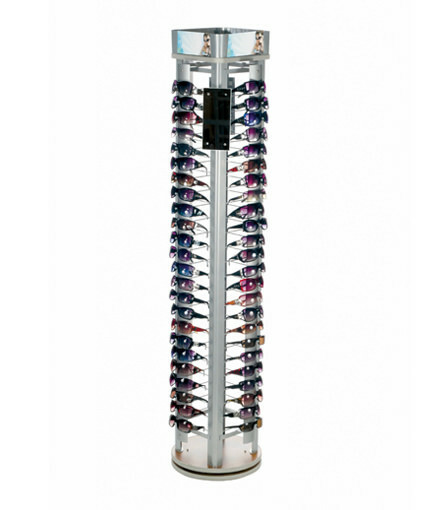 Sunglass displays with cheap bearings can bind up and stop spinning, thereby creating service issues. In our next blogpost, we will be discussing economy sunglass displays.